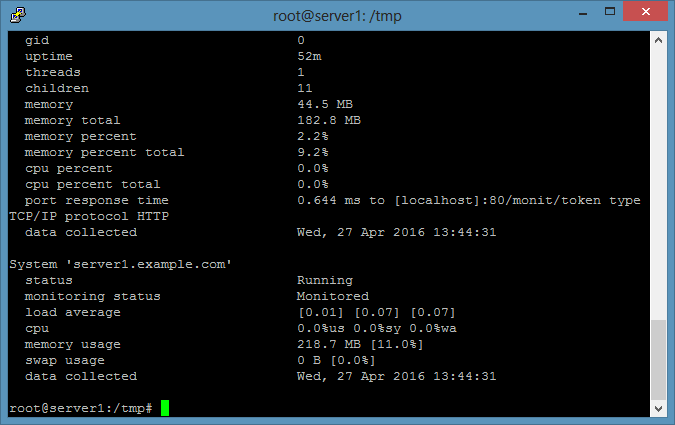 start program "/usr/sbin/service ssh start"
stop program "/usr/sbin/service ssh stop"
start program = "/usr/sbin/service apache2 start"
stop program = "/usr/sbin/service apache2 stop"
# start program = "/usr/sbin/service mysql start"
# stop program = "/usr/sbin/service mysql stop"
# start program = "/usr/sbin/service proftpd start"
# stop program = "/usr/sbin/service proftpd stop"
# start program = "/usr/sbin/service postfix start"
# stop program = "/usr/sbin/service postfix stop"
# start program = "/usr/sbin/service nginx start"
# stop program = "/usr/sbin/service nginx stop"
# start program = "/usr/sbin/service memcached start"
# stop program = "/usr/sbin/service memcached stop"
# start program = "/usr/sbin/service pure-ftpd-mysql start"
# stop program = "/usr/sbin/service pure-ftpd-mysql stop"
# start program = "/usr/sbin/service bind9 start"
# stop program = "/usr/sbin/service bind9 stop"
# start program = "/usr/sbin/service ntp start"
# stop program = "/usr/sbin/service ntp stop"
# start program = "/usr/sbin/service mailman start"
# stop program = "/usr/sbin/service mailman stop"
# start program = "/usr/sbin/service amavis start"
# stop program = "/usr/sbin/service amavis stop"
# start program = "/usr/sbin/service courier-imap start"
# stop program = "/usr/sbin/service courier-imap stop"
# start program = "/usr/sbin/service courier-imap-ssl start"
# stop program = "/usr/sbin/service courier-imap-ssl stop"
# start program = "/usr/sbin/service courier-pop start"
# stop program = "/usr/sbin/service courier-pop stop"
# start program = "/usr/sbin/service courier-pop-ssl start"
# stop program = "/usr/sbin/service courier-pop-ssl stop"
# start program = "/usr/sbin/service dovecot start"
# stop program = "/usr/sbin/service dovecot stop"
Depending on your configuration in /etc/monit/monitrc monit will restart your services if they fail and send notification emails if process IDs of services change, etc. 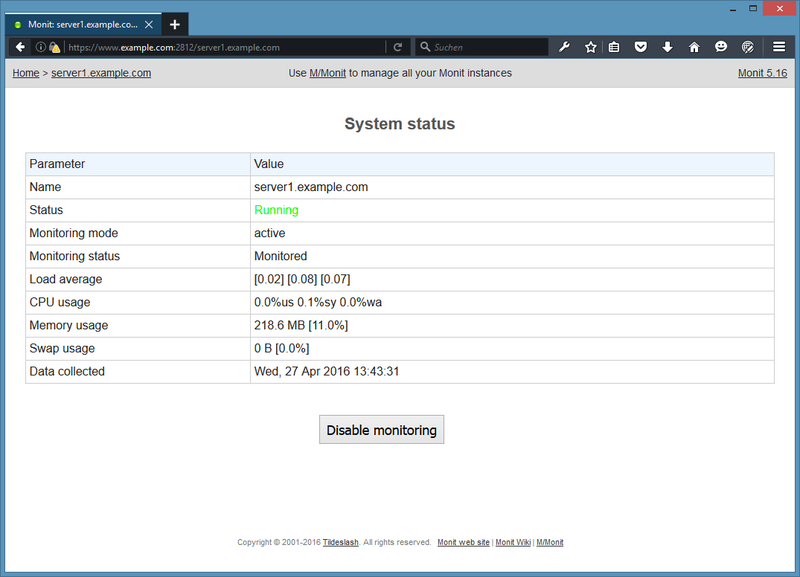 The command will show the status of all monitored services. 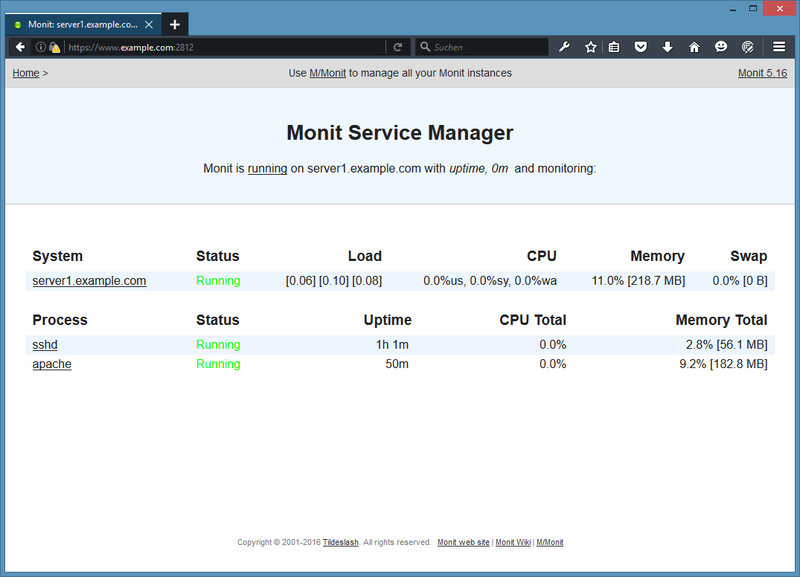 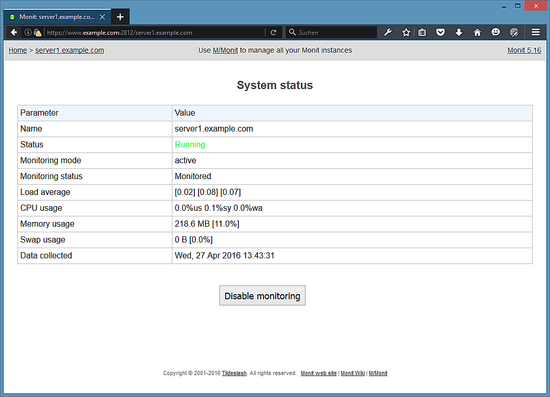 The ISPConfig Server Control Panel can show Monit data within it's Monitor module. To enable that function in ISPConfig, login to ISPConfig as Administrator (admin) user, go to System > Server config, fill in the URL, username and password for Monit as shown below. It's working like a charm for me.